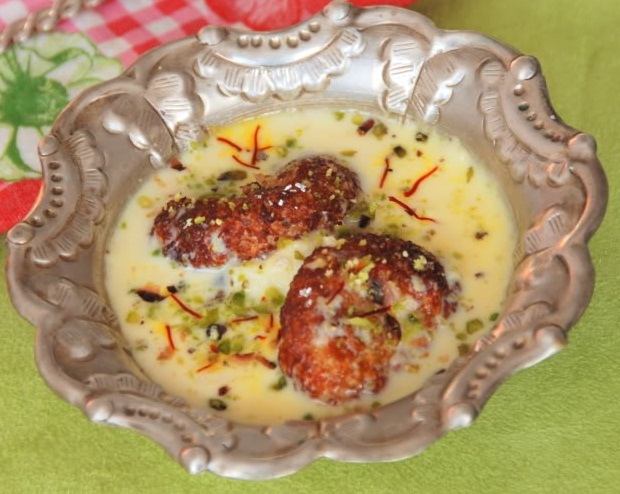 Rasabali: Rasabali is a sweet dish from Orissa, India. Rasabali is offered to Baladev ji (lord Balaram), and originated in the Baladev ji Temple of Kendrapara. It is one of the Chapana bhoga (56 bhogas) of Jagannath temple. It consists of deep fried flattened reddish brown patties of chhena (cottage cheese) that are soaked in thickened, sweetened milk. Mix chenna, all purpose flour, semolina, 2 tablespoons sugar, baking soda and green cardamom powder. Knead to make smooth dough. Make 16-20 small equal sized balls. Flatten each ball by using your palms, to make a small patty. Heat the oil to around 180°C in a kadai or a deep bottomed vessel. Add the flattened chenna balls, few at a time and deep fry them till both the side turns to golden brown in colour. Drain excess oil in a kitchen tissue paper. Mix the milk and milk powder in a heavy bottom non-stick vessel. Boil the milk mixture in low flame. Add in the crushed cardamoms, sugar and half of the saffron strands. Cook the milk; stirring continuously for about 40-45 minutes or till the milk is reduced to half the initial amount. Add the fried chenna balls to the boiling milk. Boil for another 3-4 min in a low flame . Let the rasabali cool down to the room temperature. Serve, garnished with slivered nuts and saffron strands.